What do I do if I’m feeling in crisis? If you are feeling in need of emergency support, and / or feel you cannot wait for your regular appointment, help is available. Read more about options when feeling in crisis. What is a therapeutic assessment? Assessment is a very important part of therapy and designed to ensure safety for both client and therapist. As a counselling psychologist I would probably use a technique called formulation, which involves an all round look at what seems to be happening in order for us to decide how to move forward. One of the decisions that has to be made is whether I am the right person to work with you at this time as it is important I work within my training and experience. If not, I belong to a local network of private practitioners and would look to refer you to someone more appropriate. Often, the assessment process itself can be therapeutic but it can also feel a little impersonal answering questions. My advice would be to bear with it and don’t be worried about asking questions along the way. We will hopefully be building a trusting, therapeutic relationship, working out what you would like from therapy and how to get there. How long therapy might last will be an individual consideration which might change along the way. What would usually happen is we would agree a number of sessions then review this as we are going along. I have worked with short-term therapies and longer term treatments, so am happy to work with both. Compassion focused therapy (CFT) was developed by Clinical Psychologist Professor Paul Gilbert who observed that it was often difficult to reach those struggling with issue of shame and self-criticism using Cognitive Behavioural Therapy (CBT) techniques. He noticed that these people could engage with the CBT model but not feel any better and being something I’d encountered I started investigating what might be helpful as a therapist, ultimately training to an advanced level in CFT. You can read more about Compassion Focused Therapy here. There are several different types of psychologist trainings – Neurological, Sport & Exercise, Forensic, Health, Counselling, Educational, Clinical and Occupational. There is probably most overlap between Counselling and Clinical psychology trainings – the biggest difference being that Counselling psychology trainings include the requirement to provide a minimum of 450 hours of therapy with clients. Counselling psychologists are encouraged to understand and work with the context of what is being presented. You can read more about what the British Psychological Society say about Counselling Psychologists here. Good supervision is crucial for client safety and supports therapists performing their often difficult work. Supervision is a safety net for therapy as it supports therapists performing their work. A supervisor should understand the type of therapy utilised in order to lend guidance, and improve the ability of the therapist to provide value to their client. Therapists are human beings and it is important to have this safe feedback system to make sure they are practicing appropriately. Even supervisors have supervisors so in effect it’s like a mirror in a mirror, in the hope that you as the client are looked after. Supervisors are usually experienced in the type of therapy being offered and are also bound by ethical and practice guidelines, according to the professional body they affiliate with. I have two supervisors; one for my online work and one for my face-to-face practice. Read more about the way I provide supervision for therapists. What are talking therapies and how do they work? NICE (National Institute for Health and Care Excellence) provides guidance for the NHS on how to treat certain health conditions and often advocates talking therapies for common mental health issues (e.g. depression and anxiety disorders). Talking therapies are a range of psychological therapies that each have their own evidence base. Some therapists have one approach, but quite often you will be treated with a mixture of approaches to meet your needs. The charitable organisation Mental Health UK have a well written article about different types of therapies and what you can expect from trying them. How talking therapies often work is in helping people work through the problems that are causing them distress and move forwards in their lives, but people come for all sorts of reasons so there is no one size fits all solution. In my experience the beauty of a talking therapy is that it gives you the freedom to talk through whatever is troubling you in a safe place, with a safe person. Lots of people who come to a talking therapy do have people in their lives that care about about them; but it can feel very difficult to talk to a loved one about a deep emotional issue for fear of upsetting them. Sometimes the idea of talking through a problem is compounded by feelings of deep shame or highly self-critical thinking, and a therapist skilled in working with these issues can often help. How do you ensure confidentiality and safety? Confidentiality and safety of your personal information is of the upmost importance to me, and I take great care to ensure your information is securely held. You can find out more about confidentiality and safety here. What is your digital policy? My digital policy covers the way I operate online and where you might see me. It includes information on how I use the digital space to; issue invoices, use email, text messages, webcams for therapy over video, social media and search engines. You can read my digital policy here. Why do you charge these prices? This is a very legitimate question and in the interests of being open and honest I would like to answer it. I like to think I am offering value for money as I can assure you that I have a very high level of training and experience. When I am working with you it will be to the highest possible ethical and professional standards. I will be devoting the time we are together towards helping improve your mental health and make sure I am as rested and prepared as possible prior to our meetings. In our agreement it will state clearly how much money is being asked for and when payment is due. This may be prior to the therapy in order to make sure taking payment doesn’t interfere with therapy. Whilst I hope we manage regular appointments, there are of course occasions when life gets in the way, and I completely understand that. What I would ask is that 48 hours notice is given in order that I can schedule something else in the gap and not travel to the therapy venue in vain. Missing an appointment without notice means I will need to charge (as per our agreement) to cover costs, and it also means I cannot schedule in another work engagement. Like any other self-employed private practitioner I have overheads to pay for, such as; room rental, telephone costs, paying professional bodies, travel costs, recouping the cost of my training, keeping up to date with additional training and tax to name a few. I hope you can appreciate why I have made these decisions. What is the story behind the logo? One day I was feeling a bit under pressure from life so, as I often do, walked out into my garden to grab a bit of fresh air. It was a dewy spring morning and as I looked around I was stopped in my tracks by the following sight. 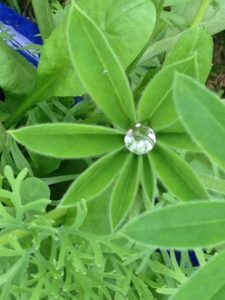 There, in the middle of a lupin leaf, was what looked like a diamond! Of course it was a big dewdrop but it was such a striking sight I took a picture and vowed that if ever i were to have a logo this is what it would be based on. The power of this image stands to remind me of the strength we can find in having compassion for ourselves and others, and the courage it can take to reach and maintain a compassionate position. The logo was designed by Godjira websites.